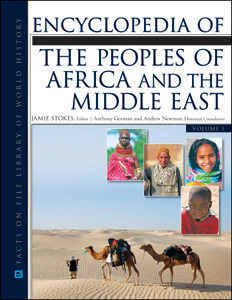 Encyclopedia of the Peoples of Africa and the Middle East is a two-volume A-to-Z reference to the history and culture of the peoples of Africa and the Middle East. This fascinating resource includes about 900 entries on the major peoples that have maintained a cultural identity in the area—from ancient to modern times—summarizing their history, migration, culture, belief system, social organization, and relationship to other peoples. Students will find entries on the Assyrians and the Asante, as well as entries on "Iraqis: nationality" and "Ghanaians: nationality," describing who they are today with cross-references to the various ancestral peoples. Entries on all large or well-known groups include up-to-date information on their geography, origins, languages, history, and culture, with subsections on topics such as subsistence, religion, social and political structures, economy, government, military practices, dwellings and architecture, clothing, transportation, technology, art, music, and literature. Invaluable reference features include a chronology, glossary, bibliography, and a comprehensive index, and a fact sheet, timeline, examples of further reading, maps, and pictures complete this authoritative reference. Appendixes offer helpful background information on topics such as the regions of Africa, kinship systems, religious systems, and subsistence systems. "Recommended for larger public libraries..."
"The user-friendly layout, visual images, and high level of scholarship make this a suitable choice for historical or sociological investigations. Recommended." "...well written with clear and concise explanations...Any library that desires to have a comprehensive overview of the cultures of Africa and the Middle East should purchase this encyclopedia for their collections."